March 24th is World TB Day. This day celebrates the anniversary of Dr. Robert Koch’s discovery of the TB bacteria over a century ago and reminds the world that TB is still around. 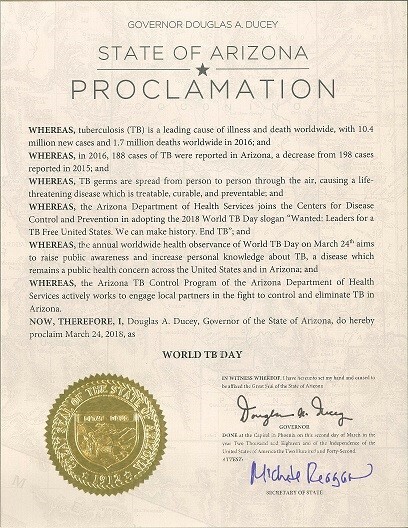 This year, Governor Doug Ducey signed a proclamation to recognize World TB Day and ADHS joins CDC and WHO in adopting the 2018 slogan “Wanted: Leaders for a TB Free United States. We can make history. End TB”. Tuberculosis (TB) continues to be one of the world’s most deadly infectious diseases and among the leading causes of death worldwide. In Arizona, TB remains under control, but has not been eliminated. The newly released numbers from Arizona’s TB Control Program show the numbers are unchanged from 2016 to 2017: 188 active cases. This puts Arizona just below the 2017 national average of 2.8 per 100,000 people. Continued work must be done to reach TB elimination in the United States. Every year, ADHS works with local public health departments and healthcare professionals towards a TB free Arizona. We can make history. End TB! As an Arizona resident it gives me some reassurance in the Arizona Department of Health Services and the Arizona Governors Office to see that our Officials are still fighting this fight. 2.8 of every 100,000 people may not seem like a large ratio, and in reality that is a very low number of people that have Tuberculosis (TB). But that does not mean that TB is not a threat today. Tuberculosis is such a contagious and malicious infection that 2.8 people could turn to 28, 280, 2,800 people very quickly. Do not forget that the infection is still one of the worlds deadliest. Last year alone, the air born virus devastated countless families. Taking in total approx. 1.6 million lives. Kudos to Dr. Christ for her continued efforts. The AZDHS Director deserves recognition for the way she has carried the banner for Arizona as the United States tries to rid herself of such a deadly enemy.